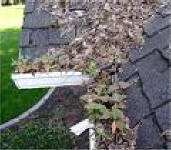 Keep your gutters maintained by cleaning them out at least once a year to prevent damage to brickwork and surrounding areas due to water overflowing from blocked or full gutters. Failure to maintain your guttering could lead to serious damage to your property. Our prices start from as little as £30 for a small house, £40 for a medium sized house and £50 for the largest of houses.